Wastewater, whether collected or uncollected and generated by some 500 million people in Europe, is a major source of water pollution affecting freshwater quality (Directive 2000/60 / EC, Water Framework Directive) and (Directive 2008/56 / EC, Marine Strategy Framework Directive) and presents a risk to health and the environment. The Urban Wastewater Treatment Directive (UWWT, 91/271 / EEC) sets minimum performance standards for the collection and treatment of these waters with regard to the macro-pollutants that are suspended solids, organic matter and nutrients. This is one of the key environmental policies of the EU “acquis communautaire” in the field of water. Its implementation since its adoption in 1991 has led to a very significant reduction in the discharges of these pollutants, which are the main factors of asphyxia and eutrophication in aquatic environments. The Directive regulates the collection, treatment, and discharge of wastewater, by setting objectives to be achieved according to the context (size of the agglomeration, impacted receiving environment, type of water body). After 26 years of implementation, the Directive is still relevant, as was pointed out by a "right to water" citizen initiative, which showed the importance given by citizens to quality sanitation services. In this context, the European Commission wanted to modernize the information system to make data more accessible and the assessment of the situation more transparent. For this purpose, it created an original concept called the Structured Implementation and Information Framework (SIIF), which it wished to develop with the most mature directive in terms of collection and processing of structured data: the UWWT Directive. The work carried out lasted four years. It began with an analysis of the tools and chain of data collection and processing already existing to modernize it by using the latest computer tools and computing power to make data more accessible to all potential users. A phase of prototyping and integration with the requirements of the INSPIRE Directive was then conducted and allowed to install 7 platforms to cover different contexts and demonstrate the robustness of the system. Finally, its development in all the countries allowed accompanying the assessment in the 9th reporting of the Member States. With its experience in web platform development, as well as in data exchange processes, IOWater managed the challenge of producing an ergonomic and intuitive open access platform. This platform has been tailor-made to the requirements of the UWWT Directive, while maintaining a flexible structure, allowing it to adapt, if necessary, to other themes. 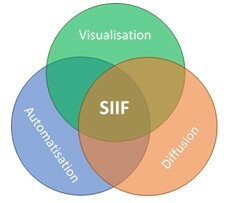 The SIIF tool has been designed to be a collaborative tool that allows visualizing all the structured data relating to the different European Directives, with the possibility, in the long term, of crossing these data together to strengthen the links between the different Directives, and create information spaces for all citizens of the European Union. The platform provides a robust and flexible structure to gradually add other reported data and enrichment along various lines. IOWater can assist any operator interested in managing its facilities or visualizing its data with a tool of this type, helping and training the authorities of a country that would like to install the platform on their national IT structure or any other project. Today, SIIF has only been developed with the UWWT Directive, and it is still a tool mainly used by the European Commission and the State services responsible for reporting. It could be used tomorrow to collect data directly from wastewater treatment plant operators, or to view other related data such as the discharge authorization register or other datasets such as E-PRTR industrial emissions.